At five years old, Murungu (which is an African word meaning “Big Chief” and perfect for this big-spirited dog) had grown up enough to pass his evaluation with Pet Partners, an experience that his handler Diana Roberts calls his fifth birthday gift to her. Every two years, they would go through the process of re-evaluation, anxious to find out if Murungu would be calm enough to continue his therapy work. Murungu excelled with the patients, making him the perfect fit for Diana’s volunteer work in a hospice care setting. He knew intuitively what patients needed and when they’d had enough. 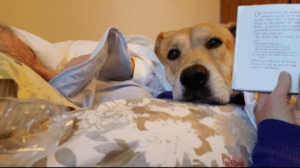 Best of all, he loved to snuggle with them in their beds – giving each a strong, warm hug. Frequently, his muscular 86-lb. body would dwarf their frames, shrunken through illness. Most of the people Diana and Murungu visit have no family in the area or at all, making visits from all of Diana’s Pet Partners incredibly meaningful. They love the warmth and unconditional acceptance that the animals offer. Often, they will then relax enough to talk about matters that are important to them, including end of life and transition questions. 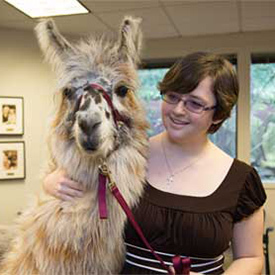 While there are many visits that were meaningful during Murungu’s eight and a half years as a therapy animal, one in particular has always stuck out for Diana. Maxine, a patient at Horizon Hospice, had always been happy to see Murungu. Diana grew worried when the staff said Maxine would not be interested in seeing Murungu. 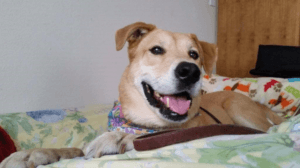 During another visit, Diana stopped by Maxine’s room, and Maxine immediately cheered up as soon as she spotted the wagging tail outside her room. Maxine invited them in and Diana instructed Murungu up onto the bed. After enjoying Murungu’s presence for quite some time, Maxine began expressing her fear about what was coming next for her. She began telling Diana that she needed to take a trip and wanted to know if her own dog would be waiting on the other side. Diana did the best she could to comfort her, realizing quickly what Maxine was referring to. A few days later, Maxine passed. Diana is hopeful that Maxine’s exchange with Murungu helped ease her fears of what was to come. Diana understands the challenges that come with hospice volunteer work. 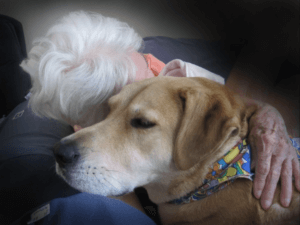 90 percent of the 10 years that Diana has been volunteering with all of her Pet Partners in hospice care, they have been the only Pet Partners team at the facility. She hopes that other Pet Partners volunteers will consider volunteering in a hospice setting after reading this story. RIP Murungu, a wonderful therapy dog!